Light Supplier has a new Touch Dimmer which is compatible with all out 12V LED Lighting ranges. It offers a simple plug and play connection system, so lights can be controlled from a single switch.The unit incorporates a soft blue light to aid location in the dark, and surface mounting fixing method via 2 x screws, which are hidden by the clip on the brushed nickel fascia plate. 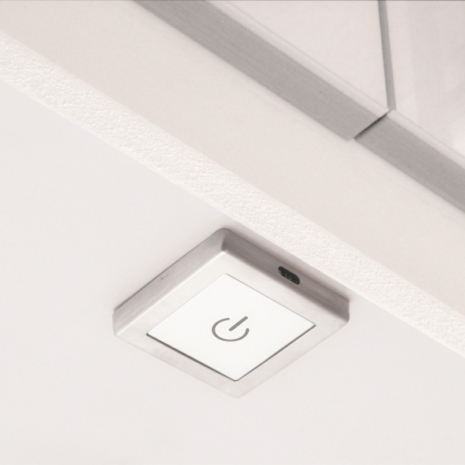 The unit includes a 12 way distribution block for connecting your lights. Where in the circuit does this fit? Is the dimmer installed in the circuit before or after the driver? How many (of your 6w under cabinet panels) lights will the dimmer control? The Dimmer is installed between the driver and the lights. A maximum of 6 lights can be controlled. will the dimmer remember its settings, on/off and dimmer settings if the power is interrupted? What are the dimensions of the dimmer? How does it actually work? - tap to turn fully on, tap to turn off and cycle through bright to dim back to bright if you keep your finger on?